CopperWynd Resort and Club is a Sonoran Desert oasis in Fountain Hills, Arizona boasting panoramic views from its scenic setting in the McDowell Mountains. It is here where you'll find the talents of Executive Chef Paul Steele and his wonderful menu at Flourish, the resort's beautiful signature restaurant. Stepping into the striking lobby, your gaze is immediately drawn to the stunning view. Flourish, an airy, stylish space decorated in soothing grays and warm wood tones, takes full advantage of this sweeping scenery with a wall of windows that can be opened to encompass terrace dining for a seamless indoor-outdoor dining experience. Does the food live up to this mesmerizing view? It most certainly does. A native of El Paso, Texas, Chef Steele's first step into the hustle and bustle of the restaurant scene was as a young dishwasher at Bobby Q's, a Texas barbecue spot. By the time he had moved on to a local country club kitchen, he knew he wanted to pursue a culinary career. "The chef there was super-talented, and there were two other chefs, one who went to culinary school in New York and the other to Scottsdale. I ended up applying to Scottsdale, got accepted, and that's when I moved out here in '99." While attending school, he worked at two of Arizona's best establishments - Tarbell's and T. Cook's at the Royal Palms. He later returned to Tarbell's as Head Chef and joined Mark Tarbell's team for his 2006 win on the Food Network competition Iron Chef America. In his decades-long career, this accomplished chef has also honed his experience at the Herbfarm in Seattle, Washington, and locally at Silverleaf Club, the Cafe at the Phoenix Public Market, and the Living Room, before bringing his culinary talents to Flourish in 2016. As a food writer, one of the many perks is the opportunity to st down with gifted chefs, and there are some whom you feel especially honored to meet. Possesing genuine warmth, compassion, and culinary prowess, Paul Steele is such a chef. At Flourish, his menu puts a spotlight on pure, clean flavors and his primary tenet of "staying true to the ingredients." The menu changes seasonally, but you may find tuna tartare presenting as cubes of ahi graced with ginger, soy, sesame seeds, and bright citrus notes of Japanese yuzu, accentuated with avocado, micro arugula, Fresno chiles and watermelon radish, accompanied by crunchy taro chips. Creamy goat cheese fondue is heightened with the addition of smoked mozzarella and ricotta, a double-thick pork chop is rubbed with paprika and coriander before being smoked into tender juiciness, and crispy-skinned trout seasoned with Dijon mustard and fresh herbs sits on a bed of creamy poached potatoes and leeks nestled in a velvety sauce of sweet pureed carrots. I had a chance to sit down with this soft-spoken gentleman on Flourish's picturesque patio and learn about his favorite restaurants, why he values humilty, and how important it is to have a healthy balance in work and personal life . How would you describe your food philosophy? I don't like to over-complicate things. I like the food to taste like what it's supposed to. It always starts with a great product because then you don't have to do a lot to it. It's about making what feels right about the dish, not forcing ingredients into a dish just to make it sound great or make it look like something it's not; trying to be as pure as possible. That's what was instilled in me when I was learning, so to me I don't know any other way. Do you have a favorite ingredient? I like to use fresh herbs. As much as I can and where I can. They're so fresh and bright. Learning how to use them and when to use them I think is really cool. They're talking about adding a garden here, maybe this summer. Do you source locally? I try to as much as possible. Because of the the way things are grown out here, they taste really different. I think people are more into that craft style, whether it be cocktails or food. It makes them feel good about what they're eating. They know that it's local. It's such a big deal now. You see these commercials for 'food made with real food'. Shouldn't that have been like that the whole time? Why did we ever stray away from that? Is the local movement a change you've seen since you've been in Arizona? Absolutely. When I first came here, I hadn't really been in touch with a lot of the local produce, though being at Tarbell's made that process go by quicker, meeting local farmers and stuff like that. The farmers markets have grown. There are so many now, but when I moved out here, it wasn't like that. In Seattle they have an awesome farm-to-table lifestyle. That idea is used more everywhere and becoming more common. People are into indigenous food and plants and things like that. It's much easier to get something when it's in season in your own state than to have it shipped in. It tastes much better because it's in season, and chances are it just came out of the ground a day ago. What is your favorite aspect about working at Flourish? I can't say I have one specific thing. I think the location is awesome, it's a beautiful property. The staff that I get to work with is really fun. And I love having the freedom to create. I think for every chef out there, that's the driving force. Everybody wants to have their own menu where they get to make the ultimate decisions. I'm all about that too, but I don't make the menu all about me. It's really important to stay humble. I try to be super open-minded about food and listen to other people's ideas. I'm really big on constructive feedback. Not everyone likes the same flavor profile or taste, I get that. When you have waitstaff who are really good with wine, they can pick up flavor notes that I never even thought about, and that's a plus. Some restaurants have a mentality of front versus back of the house, but it shouldn't be that way. It's so much easier when everyone is on the same page. Then the people who come in and sit down will have the full dining experience. It's never about me serving 200 people here on a Friday. It's about the five or six guys in the back that are working hard and getting their butts kicked, and then coming back the next day and doing it all over again. It's another sense of how I try to stay humble - it's about those who come through the doors because, without them, I'm just another cook. Another reason I like working here is because we have a balance in schedule and life. I have a sous chef whose name is Thomas, and we'll rotate schedules so that I can have some morning shifts where I can get off and hang out with my daughters, and then he can have some morning shifts to hang out with his kids. Being in the restaurant industry, you have to work a lot and and you miss out on things and you'll never get that time back. Never. But there will be plenty more days to work 16 hours in the restaurant. So I try to give my employees time to do things, because I know that I need that in my life, so I imagine they do too. And when you're at work all the time, you get burnt out and then you're no good to anyone. You end up despising your job because you missed an anniversary or you missed a birthday. All that is really important to balance because you can't come into work focused if you're still upset about missing mom's 50th anniversary. There are times I have to be at work and miss things, and that's going to happen. But I shouldn't miss all of them. And neither should anyone else. When you're burnt out, you're not creative. You're miserable at work, you're miserable to work with, and no one likes to work like that. And the effects just snowball into something else, so it's not easy. I try to give everyone the same opportunity to take time off. They say summer is a good time to take time off, but life doesn't just happen in the summer. To be honest, most things don't happen in the summer here because it's too dang hot. The best season is in October or April. It's also the time for weddings and outdoor events. You want to sit on a patio and drink a Bloody Mary when it's nice out. You have to give people time to do that stuff. And when they're happy, they work twice as hard for you. Cooking has been stereotyped as you're going to work 16 hours a day and eat while you're standing up and you're not going to see your wife and you're not going to see your kids, but that doesn't sound fun to me at all. I don't want to live that way and I don't want anyone else to live that way. If you're happy when you cook, the food tastes so much better. That's fantastic, and so true. When you do dine out, what are some of your favorite restaurants? I love Asian food, especially Japanese cuisine. When I go out, I'm usually out with my daughters, so we'll go someplace familiar. Sushi Bei on Scottsdale Road is close to me. There's Sushi Roku at the W. Nobuo at Teeter House is still one of my favorites, and I really like Bourbon Steak. I also like Bianco's a lot; who doesn't? Flourish is located at the Copperwynd Resort and Club and is open daily for breakfast, lunch and dinner. Brunch with a Bloody Mary Bar is served every Sunday 10:30 am to 2:30 pm. On Monday through Sunday, enjoy Happy Hour from 2 to 5 (menu here). Currently, local musician Marley Taylor plays Flourish every Tuesday, 4 to 6 pm. For reservations, call 480-333-1880 or visit opentable.com. 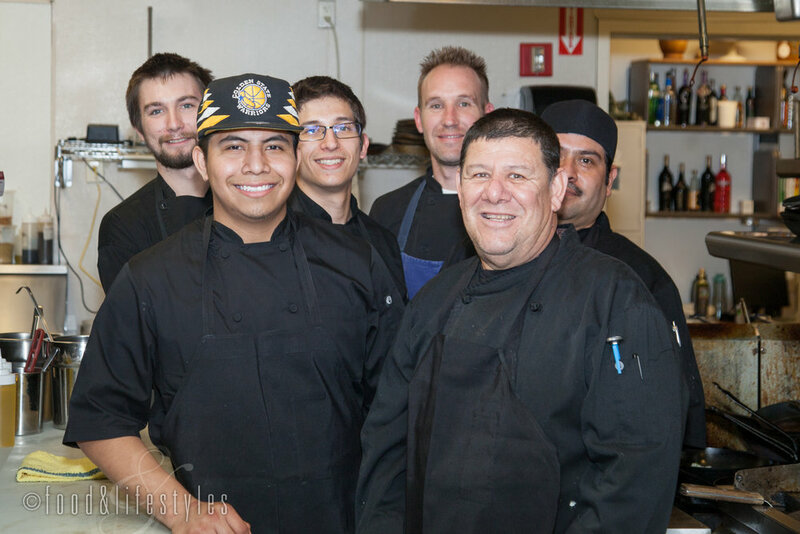 The impetus for this website was to put a spotlight on the amazing talent we have here in the Valley of the Sun, and Executive Chef Chris Neff is one of those culinary treasures. I was introduced to his craft when he was Chef de Cuisine at Meritage Steakhouse at the JW Marriott Phoenix Desert Ridge, and I'm thrilled to experience more of his magic since he has moved to the JW Marriott Scottsdale Camelback Inn to make his mark as Executive Chef at Lincoln Restaurant. Lincoln Restaurant and Bar 1936 (formerly BLT Steak) debuted in the fall of 2016, and at this beautiful resort venue Chef Neff has introduced his signature take on familiar dishes elevated to new sophistication. "My philosophy is to keep it simple and to use the best ingredients you can. I want the food to be true to itself." A self-described military brat, Chef Neff was born in San Antonio, Texas, "but we moved around quite a bit. I was in Maryland for a while, and then lived in the country of Turkey. I remember fresh octopus and uni right from the Mediterranean Sea." From Turkey, he moved to Florida and grew up in Tampa. "Although most of the men in my family cooked, including both my grandfathers, I never really thought about it until I was a busboy in college and fell into the industry. I was always watching the cooks and it looked like a lot of fun; I liked the camaraderie and team effort. I became a line cook and was awful for about a year, but then really started to train my techniques and palate and develop my passion." And develop it he did. In a short span of 10 years, Chef Neff has attained an impressive pedigree. At the Ritz-Carlton Orlando Grande Lakes, "I really honed my craft; there were a lot of great chefs I worked with." In 2010, he made a move to the Seminole Hard Rock Hotel & Casino Tampa where he ran their fine-dining steakhouse. He then went on to Manhattan when he was invited to open NYY Steak, a four-story, $10 million dollar project. "I loved New York. The hotel was right across the street from Nobu and I'd walk past Per Se and Le Bernadin so it was a really cool experience." When the Four Seasons Resort Orlando came calling with an opportunity to open their steakhouse in 2014, he returned to Florida and spent a year before heading to Arizona. "I really love the pre-planning and opening stage - hiring young cooks, ordering new uniforms, designing the menu, picking out the plateware. It's a lot of fun." He now brings that passion to Lincoln Restaurant. Before opening its doors, Chef Neff traveled to Pennsylvania to Steelite, an award-winning producer of dinnerware. "I was like a kid in a candy store. I imagined what every dish would look like on the plate, so every plate was specifically chosen for an idea in my head. That was really cool, having the opportunity to do that, because not every chef gets to pick his own plates." He also spent time at The Chef's Garden and Culinary Vegetable Institute, a 300-acre family farm in Huron, Ohio acclaimed for their superlative produce. Renowned chefs Thomas Keller and Michel Richard are among its many fans. "I met Farmer Lee Jones, and visited the Institute a few miles away from his farm. There's a kitchen with every single piece of equipment you could imagine, a dining room that seats about 80 people, a bungalow chefs' quarters, and a library with almanacs dating all the way back to the 1800s and every single cookbook you could think of. A lot of chefs write their books there or develop their recipes. It's a beautiful chefs' oasis." I experienced this exemplary focus on thoughtfulness and quality as we explored some of Chef Neff's favorite dishes. Tuna Tartare deliciously demonstrates Chef Neff's hallmark dishes that appear deceptively simple. Jeweled cubes of yellowfin tuna are dressed with a fragrant sesame oil and soy poke sauce and dotted with silky avocado cream and studded with dramatic labor-intensive black sesame rice crisps. "Basically we cook rice, black sesame seeds, and squid ink, puree them, dehydrate, and then deep fry it so it turns into a chip." Likewise, he calls his Fried Cauliflower "super-simple," but embellishes this humble cruciferous vegetable with smoked yogurt, peppery Japanese mizuna leaves, and a rotating selection of tangy housemmade pickles, currently Persian cucumbers, red onion, and Fresno chiles. 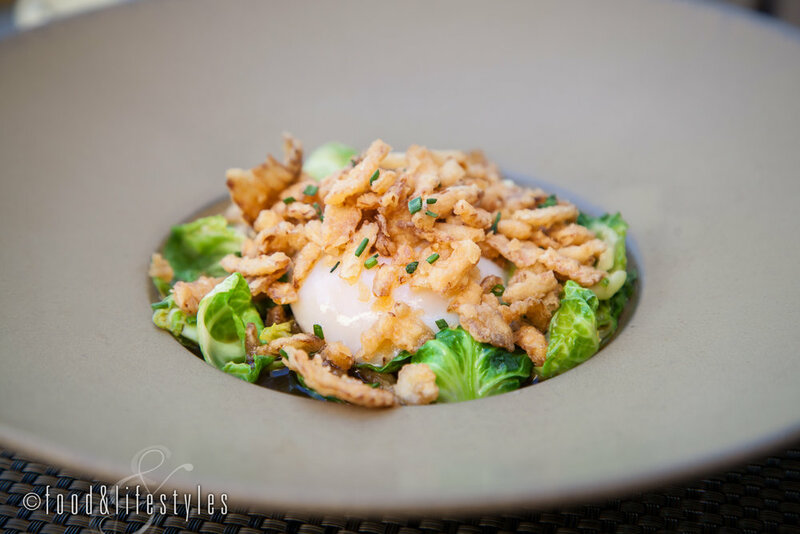 Another favorite of his (and mine) is the must-order Brussels Sprouts "Ramen." Straying from the oft-seen brussels sprouts and bacon combination that appears on many menus, "my dish is pretty unique. I wanted to do a brussels sprouts dish that no one really does. I imagined ramen or something Asian." Chef Neff accomplishes this spectactularly, starting with a ramen-inspired 24-hour broth made with smoked ham hocks, "it's super-rich, smoky, and porky - it’s great.” Raw brussels sprouts leaves are briefly poached in this flavorful liquid until they've softened, and then topped with a 63-degree Celcius poached egg and garnished with chives and crispy onion batons. "For me, I think that 63 degrees is the perfect temperature to poach an egg because you get a really nice texture on the egg white and a perfect consistency on the egg yolk." I wholeheartedly agree. A table favorite on my visits, and fast-becoming a signature dish, is Country Fried Chicken and Dumplings. This innovative presentation features chicken oysters, the coveted oyster-shaped pieces of meat that lie on either side of a chicken's backbone. Chef Neff uses Pitman Family Farms Mary's Chicken, poultry prized for being free range, non-GMO, organic, and pasture-raised. “Luckily I’m able to source just their chicken oysters. It’s very expensive, but it’s a really unique product that we’re able to offer.” At Lincoln Restaurant, Chef Neff takes this homey comfort dish to new heights. "I thought, what can I do to make it different? Okay, I’m going to do fried chicken oysters and potato gnocchi as the dumplings, and that’s where the idea came from." Complementing the tender nuggets of buttermilk batter-fried chicken are carrots and leeks and a savory chicken jus reduced for a full day to velvety richness. "It worked beautifully and I’m really glad it all came together. It's a best-seller." I also had a chance to sit down with this talented young chef to ask a few questions. Can you tell me about some of the changes made to the restaurant and bar? In Bar 1936, we replaced the lounge chairs with new high tops and we have these really cool toasting rails. The name comes from the hotel opening its doors in 1936. In the dining room, all the light fixtures are new, we replaced the chairs, have sliding barn doors for the PDRs [private dining rooms], and expanded the patios. Our back patio can fit about 100 people and we had that many last night for a private event. Our PDRs seat 20 with dividers or it can be opened to seat 50 to 60 people. We also have two gardens and I'm working with the gardener to get scheduled plantings. Any items that have surprised you with how popular they are? Yes, the sweet corn, which is my version of creamed corn with a Mexican street corn play into it that we finish with a little miso churned butter. It will be off the menu in a couple of weeks, though, with the changing seasonality. I’ll be replacing it with Ramona Farms grits with Crow’s Dairy goat cheese, finish it with the miso butter, and then I made a syrup with huitlacoche that will go on top of the grits. How often do you change the menu? Four times a year. We’ll make a small change and then we’ll do another change two weeks later, so half the appetizers and the entrées at first, and then the other half. It's easier to do it in two parts than an entire menu transition at one time. I have my staff involved in it too. It’s my turn to give them an opportunity. I have two great sous chefs and a lot of great, talented cooks that are hungry and want to learn. For the last two weeks, I've had meetings where we'll come in an hour early and sit down with The Flavor Bible. I'll tell them my ideas that I want to run with and then I'll say 'now the ball's in your court. I’ve talked to you about my vision, now tell me your ideas,whether it's a dish, five dishes, a vegetable you've found or a cool product.' Even if it doesn't make it on the menu, I'll have them develop a recipe card and run it as a special. There was always somebody there to help me and teach me, and I try to do the same for my staff. Any future plans? I’m working on trying to get an outdoor kitchen built on the back patio. I would do cooking classes, cooking demos, and private events out there. Another cool thing we're talking about is on a Saturday taking a group of hotel guests to the local farmers market. We’ll go shopping and come back to the hotel to cook lunch. I’m looking forward to doing something like that. It will be awesome. Lincoln Restaurant and Bar 1936 are located in the JW Marriott Scottsdale Camelback Inn Resort and Spa at 5402 East Lincoln Drive in Scottsdale, Arizona 85253. Reservations can be made by calling 480-905-7979. What makes Taggia at the Kimpton FireSky Resort stand out among the many excellent Italian restaurants here in Phoenix? Talented Chef Massimo de Francesca. His artful creations blend authentic Italian with a unique creative flair molded by his global culinary background. Attending the Culinary Arts (Italian) Program at George Brown College in Toronto, Canada, Chef de Francesca honed his skills working with renowned French chef Jean Pierre Challe at Toronto's Bouchon Bistro, with Michelin-starred chef Vincenzo Cammerucci at his Cesenatico restaurant Lido-Lido in Italy, and at the Westin Casuarina Resort in Grand Cayman. In 2008, he joined the Kimpton Restaurant Group at Domaso Trattoria Moderna in Arlington, Virginia and then spent 3 years in Manhattan before moving to Scottsdale and his current position as Executive Chef of Taggia. You’ll find these global influences in Chef Massimo’s bacala fritters which have swiftly become a signature appetizer. “Baccala, or salted cod, is an Italian tradition," he explains. "This is something I grew up with every Christmas, every special occasion. I have it on the menu because for me, every day at work is a special occasion." Instead of the more commonly seen braised or stewed variations, he prepares the baccala as salt cod fritters, a familiar dish from his time cooking on the Caribbean islands. Chef Massimo starts by soaking quality Canadian salted cod before simmering to tenderness in milk. This is then flaked and folded into a batter sweetened with pureed butternut squash steamed with thyme. Each bite reveals a creamy-fluffy interior enveloped in a light crispy shell that melts in your mouth. He takes it a step further by embellishing with chipotle aioli (“a taste of the Southwest”), and disks of hearts of palm. “Hearts of palm has an oceanic flavor, almost briny. We get fresh wild hearts of palm from Costa Rica and poach them in olive oil, water, salt, sugar and a little lemon juice. “ Finally, the dish is finished with a drizzle of lobster oil and strewn with fresh basil leaves. It’s easy to see why this has become a guest favorite, and a personal must-order on my visits. Another crowd pleaser he tells me is the burrata. "It's a creamy, buttery, fresh mozzarella" (burrata actually means "buttered" in Italian) . At Taggia, Chef Massimo pairs it with grilled batons of onion focaccia and and a warm caponata made with roasted peppers, tomatoes , sweet onion, raisins, and eggplant, simmered to a harmonious melange with Italian tomatoes, basil, vinegar, and sugar. The crispy-chewy bread and sweet-tangy caponata are the perfect partners to the milky burrata. Calamari is another traditional Italian ingredient that shines in the hands of Chef Massimo. You won't find its delicate flavor lost in a coating of thick batter at Taggia. Here, the calamari is marinated in an herb oil made with rosemary, thyme, garlic, onion, and lemon before being grilled and dressed with a zippy lemon-caper vinaigrette. A genius supporting element is the charred eggplant and saba puree. "The puree itself is made with the skins of eggplant so that it gives it the black color, almost like squid ink, which is kind of the play on it," Chef Massimo describes. Saba is another favorite ingredient. "Saba is a naturally reduced balsamic vinegar stored in wooden casks. All the liquid and moisture evaporates and you're left with the natural grape must. Saba is a magical ingredient, it’s wonderful, and it becomes a sweet complement to the natural bitterness of the eggplant in this dish." Baby arugula adds its pepperiness to the balance, and a shower of fresh lemon zest is the final touch. "It's a party on a plate," says Chef Massimo. He's right, I love it, and it's my new favorite calamari dish in town. Mention pasta and cream sauce in an Italian restaurant and most people think Alfredo. At Taggia, you're in for a special treat with Chef Massimo's take on this familiar dish. He starts with airy gnocchi made with fresh ricotta, lemon zest, nutmeg, eggs, and parmesan cheese, rolled and cut by hand. For the sauce, he works his magic by sauteeing garlic, onions, and sweet shallots in butter and olive oil, before deglazing with brandy and finishing with a little cream and parmesan cheese. "Then we toss in some black truffle shavings and it really just makes a wonderful perfume." Speck, a Northern Italian smoked and cured ham that chef describes as “prosciutto meets bacon” also makes an appearance. “We slice it and then slowly dry it in the oven so it gets a little crispy and intensifies the flavor.” To garnish, "chopped toasted hazelnuts adds a really lovely texture to the soft pillow-like ricotta gnocchi. You get that nuttiness, the saltiness of the speck, and the smooth creamy gnocchi." It is an amazing combination. Seafood is treated lovingly at Taggia, as seen in a wonderful capesante (scallop in Italian) entree. "We start with East Coast, dry packed, sushi grade scallops. You’ll see the wonderful caramelization that happens with the cast iron pan. Everyone who has our scallops say the same thing – these are the best scallops I’ve had in my entire life." I agree. They are nestled in a silky heirloom carrot puree whose natural sweetness is magnified with a hint of coconut milk, paired with roasted corn, and crowned with an avocado salsa brightened with lemon and lime juice and capers as a nod to a Sicilian accent. "The puree itself acts as both a sauce and a starch and is a good base for all the components. The idea is to have a bite of the scallop and a scoop of the puree with the crisp vegetables and tangy salsa." It's a dish as delicious as it is beautiful. Brasato al Barolo, a Piemontese classic often made with beef, is transformed at Taggia with veal cheeks braised for 6 hours in a rich jus of vegetables and red wine until they are fall-apart tender. Served on a bed of creamy parmesan polenta, they are festooned with a roasted medley of pioppini, portabello, and cremini mushrooms before being draped in a rich Barolo wine sauce and finished with smoked sea salt. “It’s one of the simplest dishes that we have, although it takes 12 hours to prepare the demi-glace, a reduction of Barolo, port, beef and veal stock.” It's a comfort dish that is both hearty and elegant. The same thoughtfulness is exemplified on the dessert menu, such as the zabaglione. Chef Massimo explains that it is "the Italian version of a mousse or light custard." To make this Italian dessert, "marsala wine, sugar, and egg yolks get frothed and then folded into whipped cream with sugar, lemon and vanilla." Paired with a berry salad tossed with sugar, vanilla, lemon and orange zest, and mint, it gets its Taggia touch with the enhancement of fragrant lavender and crunchy cocoa nibs. Chef Massimo is justly proud of his tiramisu, and it's a show-stopper. "It’s not your traditional tiramisu and the amount of work that goes into it is incredible." I admire the labor-intensive time that goes into this luxurious treat as I break into the dark chocolate shell encasing the layers of ethereal mascarpone mousse and sponge cake. It's a decadent finale and truly the best tiramisu I've ever had. In the hands of a gifted chef such as Massimo de Francesca, you're assured to enjoy mouthwatering modern Italian fare that might just be the best version you've ever had of an old favorite. Reasonable prices for such a quality menu is a bonus and Taggia also features specials. On Mondays, 11 am to close, "Raid Our Cellar" offers a selection of bottles of wines at a 50% discount in both Taggia and the Lobby Bar. Nightly, a 3-course "Prezzo Fisso" menu is available with your choice of appetizer or pasta, entree, and dessert for $45. Starting October 5th, Taggia will be introducing an Aperitivo Hour, modeled on the Italian tradition of socializing with libations paired with small plates. With all these reasons to visit, it's the perfect time to make a reservation and see for yourself the delights to be found at Taggia. Update: As of November 2016, Chef Massimo can be found at the Kimpton Seafire Resort + Spa on the Cayman Islands.